I spent 20 minutes taking a digital camera to pieces last night. It played havoc with my fingernails, but they grow fast and they needed cutting anyway. I was at Susan Hutchinson’s excellent West Oxford Academy, held at WOCA, and Iain Tullis gave a most interesting talk on the technology of digicams. He bought 16 broken Kodak cameras at a quid a pop and provided screwdrivers and tools to help us all pull the stuff apart. Kodak, of course, lost the plot on digital cameras and is now selling off its patents as it is in Chapter 11 – not that that helps much the folk in Harrow and in Rochester NY who have lost their jobs. Techies will know that the choice for manufacturers is between CCDs (charge coupled devices) and CMOS – silicon tech. Iain said that the choice these days is down to fashion and of course to pricing. After I’d broken my thumb nail, I got down to the circuit board of the Kodak cam I was breaking up. A Zoran chip and Hynix stuff and apparently it’s the Zoran chip that held all the software algorithms and that. All that Zoran stuff is no more, of course, the IP is all over the place. Iain showed some fab pictures of the first Kodak digicams – in 1986 we had the Steven Sasson 1.4 megapix baby, storing its stuff on an audio cassette. 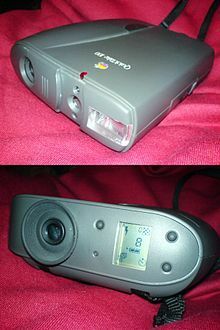 Then he showed the model Kodak tried to sell first – the Dycam model one at a cool $1,800. Kodak, of course, cobbled together the Apple QuickTake 100 – a 640 by 180 display and that. So what went wrong with Kodak? Iain Tullis said: “This is MBA fodder.” We knew it had a problem in the tech industry and the infamous recall didn’t help its credibility in the 1990s. However, Iain Tullis said that Nikon, Canon and others managed to change.